Instead of a leading nation, will the United States of America in the end times become a following nation? 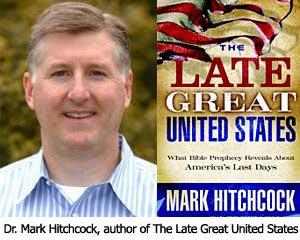 Dr. Hitchcock was invited to answer questions based on his book The Late Great United States. The subtitle of Mark's fascinating book — What Bible Prophecy Reveals About America's Last Days — states the purpose. The book digs deep into the Bible, mining for any textual nugget that might reveal some value as to the United States' future as an end time player. Dr. Hitchcock: I don't think America is mentioned in Bible prophecy. I don't see American anywhere, but then that raises a really large question of why? Of course, a lot of people would say, "Well, we are not mentioned in the Bible just like a lot of countries are not mentioned." Canada isn't mentioned. Brazil isn't mentioned. Dr. Reagan: Yes, but they are not dominating the world. Nathan Jones: They're not AMERICA! Dr. Hitchcock: I have never been to a conference and been asked, "Where is Canada in prophecy, or where is Brazil?" But, it makes sense that people would ask about the U.S. because we currently are the most dominant political, economic, and military nation that has ever existed. Dr. Reagan: And, it is even more pressing when you consider the fact that the signs of the times indicate we are right on the threshold of the Tribulation. Dr. Hitchcock: That's right. We are the great protector of Israel as well. Plus, God did mention nations that were far away from Israel. He mentions Rosh which we know is Russia. He mentions the kings of the East, some probably from China. So, God did mention places far away. If He had wanted to mention the U.S. He could have. The fact that we are not there leads me to believe that something will happen to our country that will cause us to go from being a leading nation to being a following nation. Dr. Reagan: What do you think that is? Dr. Hitchcock: There are a number of different reasons we can look out today. Since the Bible doesn't tell us, we then have to engage in some speculation, but I think it is speculation that is justified. We can look at our world today and see that oil is our Achilles' heel. Back when the Arab Oil Embargo happened in 1973 and 1974, we were importing 35% of our oil and we said we've got to get off this oil addiction. Well, now we're importing 70%! Those nations have us literally over a barrel with oil, and that is a serious thing. Another possibility is that we have the whole economic crisis, and our nation has adopted policies that are clearly going to bankrupt us. California is a good example of huge economies going bankrupt. Officially, California is already bankrupt. The national debt clock has been spinning — 10 billion, 10 trillion, 11 trillion. Really, the amount of money becomes almost meaningless after reaching such debt. We are not selling as much as we're buying. China is mainly underwriting and financing all of this debt. We are the greatest debtor nation in all of history. Another possibility is radical Islam. Could there be a nuclear 9/11? I hate to even say that. God forbid that would happen because we love this country and we don't want something like that to take place, but it could. Dr. Reagan: All a terrorist would have to do is float a merchant ship into New York Harbor with a suicide crew, set off a nuclear weapon, and this nation would be in utter chaos. We would have military law overnight. Dr. Hitchcock: Think of what that would do to our nation financially, but more importantly psychologically. There are people in this world who wake up every morning, spend all day, and then go to bed at night thinking about how they can bring down the United States which they call the "Great Satan." Today a radical Islamic attack is a very real possibility, something that horrifies us to think of it, but it certainly could take place. Those are some of the kinds of things that we can look out there and speculate on. We are certainly looking at a collapse from within. Just look at the moral fiber of our country and the weakening of it and the way this country has moved past biblical values. Dr. Reagan: It is what happened to the Roman Empire. It is what happened to the Russian Empire. Nathan Jones: History's proven that any nation that adopts homosexuality as a way of life, that is the last chapter in their history. Dr. Hitchcock: Alexander Tytler years ago explained the different phases that nations go through from birth to death. Did you know that the length of time for the existence of any of the world's greatest powers has been about 200 years? That means the United States is on borrowed time as a country. There is a biblical event that I think points to what could happen to America — the Rapture. The Rapture is that future event when Christ is going to descend from Heaven and all believers on the Earth are going to disappear the Bible says in a moment, in the twinkling of an eye. Every believer on the face of the earth is going to be caught up to meet the Lord in the air. That is an event the Bible gives that to me provides a very good reason as to what could cause this country to falter. When the Rapture takes place there will be believers raptured from all over the world, but America by any estimation has the largest percentage of true believers who know Jesus Christ as their Savior. There are more believers in the U.S. than all of Western Europe and England put together, where it could be below 1% in those nations. I will never forget years ago when I was traveling from over near Ephesus to Ismer, Turkey. While riding up around the edge of the city I looked down on a city of 3 million people and learned there are only about 2,000 or 3,000 believers living there. I realized that when the Rapture happens they will never know the difference in population. This American on the bus who disappeared, well they could care less. Now, in the United States, truly born-again believers in Christ may be about 8% to 10% according to the best statistics I have ever read on the people in this country. With believers gone the salt and light is gone. Now, you talk about a drop on the Dow Jones the next day! Dr. Reagan: You are talking about the Rapture as an event separate and apart from the Second Coming? Dr. Hitchcock: That's right, I would say that the Lord's coming is going to happen in two phases. There are not two Second Comings. The Lord is going to come back to the Earth at His Second Coming, but at least seven years earlier the Rapture will occur and we are going to be caught up and meet Him in the air. Dr. Reagan: When Jesus appears in the heavens at the Rapture He is not going to come right back down to the Earth. When He appears all believers both living and dead are taken up. You know, when that happens there will be absolute, total chaos in this country. Dr. Hitchcock: There would be, and all over the world, but especially here in this country. Dr. Reagan: We've got born again Christians in key positions all over this country — military, education, business — you name it. The only way this nation could continue to exist would be to have military marshall law overnight. Think of all the churches that would suddenly be raided, with people stealing the sound boxes and stealing the computers and everything they could get their hands on. Nathan Jones: We think that the immorality is bad now, but can you imagine with the removal of the Church how removed the restraining influence on the government will be? Can you imagine the immorality that would suddenly be legalized? Dr. Hitchcock: Yes, immorality would run rampant once all the believers are taken out, and so too any support for Israel, which is the one thing I believe even with our nation as bad off as we are in, is staying God's hand against our country. Overall, we still have always been a country that's supported Israel. Now, that is beginning to wane seriously in our country and it's something we need to be very concerned about, but I think over our history we've received good marks on our report card for how we have treated the Jewish people. God has blessed our nation greatly because of that. Once all the Christians disappear, the moral rot will deepen in our country, the support for Israel will be taken away, and that I think would deepen what evil takes place here. I also think Europe will rise when the U.S. wanes. Europe right now is the strongest economy in the world. Did you know the European Union is going to lose less then 1% of their population to the Rapture, while we will lose 8-10% of our population? America will become at that time I believe a following nation rather than a leading nation in the world. So, anyone else getting the feeling that what Dr. Hitchcock says very well could come true very soon with Khomeni's statements this last week? I find it different because it is the Supreme Leader, and not the crazy president making these noises. Our economy is what I would call officially dead, but there are manipulations going on to put a veneer on it to make it seem alive. We are in serious trouble but noone seems to notice. But one "punch" from the crazies would bring it all down. And I personally feel we have passed the line in the sand as far as what God has commanded and I know He is a God of mercy and forgiveness but the evil in American society may need correction. I just wonder if God will Rapture us out before teh corrective measures or after. Dr. Hitchcock said "Now, in the United States, truly born-again believers in Christ may be about 8% to 10% according to the best statistics I have ever read on the people in this country." HUH???!!! I doubt this very, very much. First, what is his (or the) definition of "truly". (To me John 3:16-21 would be the standard). Second, exactly who are these stats compliers and how were they qualified to judge the salvation status of others? Those percentages sound like such a low ball number that I can not buy into them. If someone can prove otherwise I'm open to it. But the lack of specifics in Dr. Hitchcock's broad statement leave serious doubt. (I say that realizing that wasn't the focal point of the conversation - I'M the one broadening the point). Who is not truly saved? Catholics? (maybe) Liberal Spiritualizers? (maybe) Any Christian that still sins after accepting Christ? (I don't think so - we are still trapped in mortal bodies with a sinful nature) This is what I need to know before accepting 90% or more of America is bound for hell. I think the majority of Americans are "true" (John 3:16-21), if you will, believers in Christ and that majority will disappear after the Rapture, thus explaining America's future lost status of insignificance. Nathan - if you (or anyone out there) care to set me straight feel free. Billy, I read those same stats, too, from the Barna Group. They asked a series of doctrinal questions vital to being born again and based their 10% or so on those who responded to the affirmative on all of them. It's not an absolute science, but it does give us a slice of life. Not to get you deeper in your stew over America's spirituality there Billy ;), but their article Barna Lists the 12 Most Significant Religious Findings is quite interesting. Thanks Nathan - that reply is what I was hoping for by my post. ....but I'll be very sad if it is so. I think a big part of me is in denial because I really love America. After a quick look at the Barna link I have to say my eyes are opened up a bit more. Very depressing trends. I still think a much larger percentage of Americans are "true" believers BUT I no longer think we are the majority. The America I grew up in and knew just isn't the same. Tragic beyond words. I have heard it different ways dawg. But honestly I have never tried to find out for myself, sorry for being lazy. BUt I believe it is John McArthur who said if you have had the chance to receive Christ before the Rapture & Tribulation you will not have the chance to accept after. Now, I know Christ is capable of drawing all to Himself, but I took this to mean, the old man sinful self nature is such that if you have said no before a little tribulation is not going to change your mind. We are creatures of habit and with tech being what it is and man-centeredness being rampant I figure there will be many seemingly rational explanations for the Rapture that will distract people from true understanding. I mean just think of it, we go to movies now that don't even have human actors and yet they seem so real. I believe this will be a prime tool for a great satanic deception. And doesn't Revealation teach us that even after Christ reigns physically on earth for 1000 years that there will still be those who cannot accept the truth. Their hearts are too hardened and the door is locked, by their own choice. I wish this weren't so because I have those in my own family who are not saved and even very antagonistic to the Gospel. I don't want them to go to hell and be separated from God, but they are proud, arrogant and unwilling to listen, and nothing that has changed in over 20 years, and yes I will double up on my praying for I feel we are at the cusp of the Rapture. there are many ways to interpret 2 thess ch 2. some say if you heard the gospel, understood it and rejected it you`ll have no chance after the rapture. personally, i think its WHY you rejected it. if you reject it simply cuz you put it off i think there is hope, if its cuz you`re simply not ready, there`s hope. if it`s cuz you simply love your sin too much and "take pleasure in unrightousness" then God will hand you over to a "strong dilusion" and its unlikely that person would come to christ regardless. I can agree with that, hart. If there was no hope after the rapture, why would God bother with 144,000 Jewish witnesses and the 2 witnesses? Why bother with the tribulation? God desires that none perish, and I don't think that stops at the rapture. I MUST think the way you two described what you believe.....if I didn't, my life now would be unbearable! I too have loved ones who, don't reject because they don't believe, they reject because (I believe) it is not "convient" for them in their lives now. I was there once myself. What scares me the most is that their "delay" may mean that they will have to experience the worst, most horrific time in all of history, or ever will be. i must make a disclaimer here, i THINK the 2 thss 2 passage is referring simply to people who just love their sin too much (sadly i know of such people as i`m sure some of you do too) and will NEVER come to christ BUT there is enough evidence to cause doubt and to believe if someone heard it, understood it and rejected it then there is no hope after the rapture. i`m not too certain. regardless the time to accept him is now not then. Here's a previous post on the subject by Dr. Reagan called Salvation After The Rapture. i totally agree with his conclusion on the article "i hope there is a chance but i wouldnt want to give anyone a false hope"